Pay day’s just been – here’s how we’d like to spend our earnings in April. We all have our favourite mascara…you know the one; the one we swear by for come hither eyes. But every once in a while, our favourite mascara needs a helping hand ­– like when you want to try out a hot yoga class after work, or it’s really hot and humid outside. So what do you do when your go-to favourite mascara lets you down? You Raincoat it of course! And so I did. It took two coats for me to really lock the colour in but as I have super sensitive eyes (I wear contacts), I was just really pleased that nothing reacted. It truly does work, maybe a little too well – make-up remover didn’t take it all off after a few tries, and there was still a little residue left the next morning. But would I use it again? In a heartbeat! Water restrictions have made us all appreciate a good dry shampoo even more than before. We love that that this shampoo leaves no residue. So no white-ish powder left behind in your hair which can be a mission to disperse. It’s delicately fragranced and it leaves your hair looking and smelling great. Suffer from sensitive lips? No worries, you can rock a colourful pout with expert-approved lipsticks for delicate skin. It’s ultra-silky on application and gives lips a rich intense colour with a soft satin-like finish, matte finish. The creamy, texture makes it comfortable to wear while the special “Glow Factor” helps protect lips. The “Glow Factor” consists of a special blend of cocoa lipid extract, Moringa oleifera oil, and Vitamin E, which act together to smooth the lip surface and protect and strengthen skin against free radical damage and oxidative stress. It’s available in six glorious colours. Wear this seasons hottest colour, violet, your way with Viola Ice from one of our fave local brands. This shimmering purple is perfect for channeling your inner unicorn with nails on point! For a contrast that will make the purple pop, try your hand at gold nail art using City Lights, a galactic gold that perfectly offsets the deep hues of purple. The trusted brand has added a new intense moisture addition to their Vita-Rich Range. The handy tubs are available in three variants that are infused with fresh fragrance for beautifully scented, healthy looking skin that feels comfortable all day. The creams are packed with skin-loving ingredients and extracts derived from nature. Full of rich emollients for clinically proven 24-hour moisturisation, the non-greasy formula intensely moisturises, soothes and revitalises dry skin. The creams are available in Revitalizing Grape Seed Oil, Smoothing Papaya, and Soothing Rose Water but for us, it Smoothing Papaya #FTW! The Sorbet Pedi-Care Foot Range was developed for tired feet, and salon approved by expert Sorbet Beauty Therapists to give you that salon experience at home. It includes soothing powders, heel balms, foot serums, tonics, soufflé’s (yes, soufflés – that’s French for ‘bloody awesome’) creams and sugar scrubs. So last weekend we kicked off the heels, read the instructions, gathered the cling wrap and Vaseline and turned the lounge into an erm, salon. The kit – which is the latest addition to the range – promises to peel away hard skin and calluses. Our feet were in pretty poor shape and barring the fact that the foot scraper supplied, didn’t really work (so we used our own), the results were truly amazing. The kit includes a peeling foot gel, a neutralising foot tonic, scraper, pumice stone, and glove. There’s enough in the kit to probably save yourself the price of at least 10 full pedicures, and just opt for having your toenails done. Pricewise it’s a total bargain but somehow we’d still just prefer the odd trip to a Sorbet salon instead. Which one would you be keen to try beauties? A lightweight, transparent dry shampoo which instantly breathes new life into dull, greasy hair between washes without leaving residue. Delicately fragranced to leave hair looking and smelling great. The Pedi-care foot peel duo kit sounds perfect for the coming winter days! I tried the Girlz only dry shampoo for brunettes. I must say I love this product as it absorbs most of the oil from your hair and covers your roots a little if your hair is growing the color out. Would recommend to anyone, but do not use for 2 x consecutive days after each other as it is quite powdery then! Sorbet is my go to brand for almost everything! from their foot care range I have their cooling spray, it’s so amazing after a day of walking around. Not to mention it smells pretty great too! Good to know! We love Sorbet, too. I’m keen on trying the Sorbet Pedi-Care Foot Peel Duo Kit.looks really good! i would love to try the yardley raincoat mascara! Cool products. 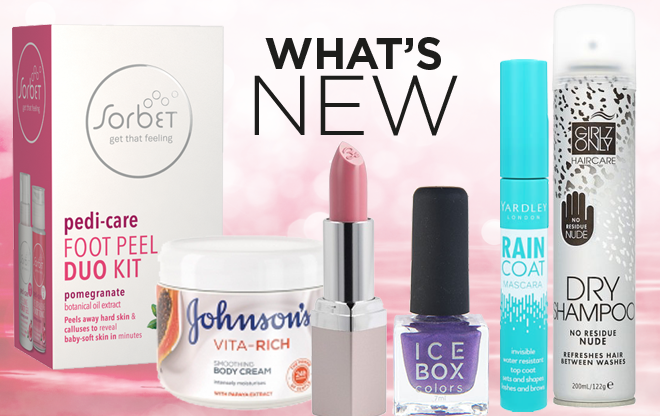 The Sorbet foot peel kit looks like a lot of fun and pampering, perfect for tired feets.